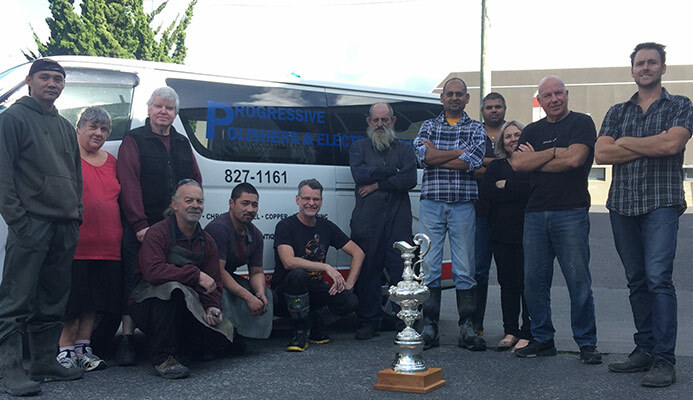 Established in the 1960s and based in West Auckland, Progressive Polishers and Electroplaters are a family owned and operated business with decades of experience in all aspects of metal polishing and electroplating. The Progressive team is made up of highly qualified and specialised metal polishers and electroplaters. Many have particular expertise in various aspects of the metal polishing and plating industry. For instance, there is an in-house silversmith who handles all silver and silverware restoration. When you deal with Progressive Polishers and Electroplaters, you deal directly with the owners – we welcome your enquiries at any time. Malcolm has been with the company since it began – that’s around 50 years of experience in metal polishing and plating. A chemical engineer, Malcolm understands every aspect of metal stripping, cleaning, polishing, lacquering and coating. Whether it’s chrome plating, copper plating, brass plating, gold plating, silver plating, zinc plating, nickel plating , or some other service you require, Malcolm is ready to advise you on what is best. He will personally oversee your metal stripping, cleaning, polishing and electroplating requirements. In his spare time Malcolm is a boat and motorcycle enthusiast and hog member. He’s a past member of the Auckland Car Club. Travis has spent his lifetime learning about the metal polishing and metal electroplating industry. His grandfather began Progressive Polishers and Electroplaters back in the 1960s. Travis remembers the company shifting into the New Lynn premises and has watched as the company has grown to become specialists in the field of metal protection and restoration. In his spare time, Travis enjoys the serenity of water sports like kite-surfing and paddle-boarding. Progressive Polishers and Electroplaters Ltd began under the West Auckland home of one of its founders. Back in those days they specialised in metal polishing Auckland – mostly plating and polishing chrome tapware for a local manufacturer. Over time they added acid baths, electroplating equipment and the other tools needed to properly strip tarnished metal, recoat it, and return it to looking just like new. Learning and gaining expertise as they went along, Progressive Polishers and Electroplaters soon became the best in their field. Malcolm and Travis now own the company and run it with the same passion and expertise as Travis’ family did all those years ago. From commercial clients, to marine and vehicle chrome plating, to a tarnished cup or trophy, to the smallest item from your house renovation, the team at Progressive Polishers and Electroplaters can make it look brand new; no job is too big or too small. No job is too big or too small for the team at Progressive Polishers and Electroplaters Ltd.
A common aspect of their work is recoating, usually in brass, hinges, catches, latches, handles, light-fittings, door knockers etc. for house renovations. They are able to restore the life to your sports trophies, church silverware or family heirlooms. Come into their West Auckland Electroplating premises and they will show you samples of their work. We have experience in all aspects of marine part refurbishment including marine rigging components and marine interior fittings. We even refurbished a super yacht with 24 carat gold fittings! Whether it’s stainless steel fittings for your yacht, motorcycle parts, or chrome for the grill of your car, we’ve done it all before and still have the passion and expertise to transform your vehicle. Some items can be small and very delicate; others are precious and have sentimental value. Everything you entrust to us will be treated with upmost care and returned to you looking like new.We pride ourselves on providing superb service and top-quality workmanship.